Original recipe: pullum praedura, condies liquamine, oleo mixto, cui mittis fasciculum anethi, porri, satureiae et coriandri uiridis, et coques. ubi coctus fuerit, leuabis eum, in lance defrito perungues, piper aspargis et inferes. Translation: A half-cooked chicken marinaded in a pickle of broth, mixed with oil, to which is added a bunch of dill, leeks, satury and green coriander. Finish it in this broth. When done, take the chicken out, dress it nicely on a dish, pour over the sauce, colored with reduced must, sprinkle with pepper and serve. 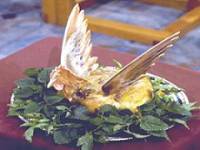 Brush chicken with olive oil or butter. Roast for 30 minutes in a very hot oven to brown the meat. When done continue cooking the bird in the sauce until done. Grind aniseed and coriander in a bowl. Mix with olive oil, stock and chives. Put in a cooking pot with the browned chicken parts, and cook till done, basting from time to time. Serve the chicken in the sauce with a sprinkling of pepper.